I’ve been annoyed by the fact that public internet providers are slipstreaming content, and also that accessing public internet access points is a potential security risk. I refer, for example to this earlier post on my blog. For some time now I have been muttering about a personal VPN and some months ago I setup one for myself. It has worked well and over the past several months I have occasionally tweaked it a bit to make it more useful. Others may have a similar interest so here is a simple how-to that will give you an inexpensive personal VPN. There is a wealth of information about VPN’s and PPTP on the web. I refer you to the Wikipedia articles in particular, this one on the subject of VPN’s and this one on the subject of PPTP. A good article about another kind of VPN called OpenVPN is found here. For my purposes, I have found PPTP to be satisfactory and have resisted the urge to upgrade to OpenVPN. I implemented my VPN solution two ways. The first was using my home Ubuntu machine as the VPN server. The second was using an instance in the Amazon EC2 cloud. I will describe below the mechanism for implementing a VPN in the EC2 cloud and provide a small addendum on how you could do this with a server at home. 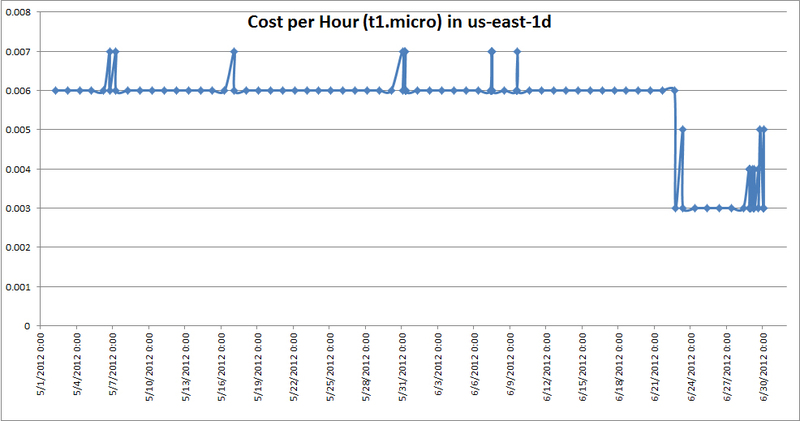 If you run the VPN the way I suggest, on a micro instance in Amazon’s EC2 cloud, the cost is very low. I run my instances as spot priced instances and invariably a t1.micro at spot price is less than a penny an hour. Here is the price graph for some months, I’ve carefully cut the data for the last couple of days off because the power outages in the Amazon us-east AZ caused the price to jump to a dollar and that makes the graph less attractive 😉 Seriously, that is an aberration, my VPN server is setup with a price cap of $0.02 per hour and it died when then price shot up. I restarted it manually at the standard price when that happened. In addition, depending on how much data you send over the VPN, you will also be assessed a charge for data transfer. I have found that to be minimal. Since I run my VPN on my personal Amazon account (we also use EC2 for work), I get the benefit of the Free tier for the first year and the VPN hasn’t exceeded the free tier usage at any time. Of course, if you run the VPN on a server in your house, you don’t have to worry about these costs; all you have to ensure is that you can reach the VPN server from any place. More about that later. I launched an EC2 instance based on the stock 12.04 LTS AMI provided by Amazon. A t1.micro instance is more than sufficient for this purpose. If you are using some other cloud provider or are planning to do this on a machine at home, get yourself access to a machine that has some recent flavor of Ubuntu or Linux and to which you have root access. If you are doing this in Amazon, you must first setup the security group for this instance, before you launch the instance. Skip forward to step 6 in this how-to and setup a security group as described there and launch your EC2 instance using that security group. The configuration itself is quite straightforward. First you need to identify the range of IP addresses that will be used by your VPN. This includes the IP address that your VPN Gateway will use, and the IP addresses for the hosts that connect to the VPN Gateway. For a variety of reasons, I chose to set my VPN Gateway at 10.40.1.1 and the IP Addresses it gave out at 10.40.1.20-10.40.1.50. This setting is in/etc/pptpd.conf, edit using your favorite text editor, remember you must be root to do this. Your PPTP Server will hand out IP Addresses and DNS settings to clients. It is a good idea to set DNS Server settings in the PPTP Server so that clients can do name resolution. This is done in /etc/ppp/pptpd-options, edit using your favorite text editor, remember you must be root to do this. I chose to specify above that the PPTP Server should hand out the addresses of the Google public DNS Servers and the Amazon public DNS Server. You can use any servers you want. Finally, configure the PPTP Server with login credentials. You can setup as many users as you want on the PPTP Server, I chose to setup three. For simplicity, let me call them user01, user02 and user03. I use a random password generation script to make up the passwords, something similar to the one described here. User name and password are stored in the file /etc/ppp/chap-secrets. Edit it with a text editor and add lines line these into it, one per user that you wish to setup. At this point, your PPTP Server is mostly ready to go. Just a couple of more things to take care of. Update /etc/rc.local and add the following two lines to make NAT work properly. Update the interface name to suit; I used eth0, you may have to use something else. Step 4: Making your server accessible remotely. If you are using a server in the cloud, or if you are using a home machine, there is a chance that it’s public IP address will change from time to time. For example, your server in EC2 may be restarted, your home ISP may reassign your IP Address etc., I use a Dynamic DNS system to make my servers always accessible. Personally, I have had good luck with the DDNS service provided by Dyn. Even if you choose to use their free trial to begin with, if you use your VPN at all, you will have no problem spending the $20 per year for this very good service. Most of the configuration you need will be done during the installation but just to be sure, go and look at the file /etc/ddclient.conf. You can use the handy-dandy configurator at Dyn to get the right incantations. My /etc/ddclient.conf file has the following in it. This is the final step to get the things all up and running. Step 6:Setting up your firewall for remote access. Irrespective of whether you are using an Amazon EC2 instance of a machine in your own house, you will likely need to tweak your firewall to make things work correctly. Amazon calls the firewall a security group, configure it to allow incoming connections on TCP Ports 1723 (and 22 for SSH). I also open ICMP so I can ping it to make sure it is responsive. On Amazon I also tend to leave all ports open for loopback. Note regarding in-home setup: You can ignore the last two for your in-home configuration. Depending on the router of network access device you have, you may have to setup port forwarding rules. See the documentation for your router/access point for details. First, attempt to ping your server from a client machine. Shown here from my Windows PC. As you can see, my Dynamic DNS entry has worked and the name resolution is working correctly. Then attempt to connect to the VPN. On Windows and Android this is relatively straightforward.I had a little trouble with Ubuntu. My Ubuntu machine is running 10.04 LTS, note that machines running versions of Ubuntu prior to 10.04 require additional configuration before you can make PPTP work properly. You may find that your VPN works properly from Windows and Android (for example) but it doesn’t work on Ubuntu. This is what happened for me. You need to perform one additional configuration step on Ubuntu clients and that is to add a line into the chap-secrets file. Here is what I have in my /etc/ppp/chap-secrets file on one of my Ubuntu client machines. It is basically the same line as you used in step 2 above. With this line, connection from Ubuntu was effortless. The setup above will come up automatically when the machine is restarted, it will automatically register with Dynamic DNS and should work well for you. For users of Amazon EC2, one final step remains. Use either the GUI or the ec2- CLI and make yourself an AMI. Then you can setup a script that will launch a persistent spot request for a t1.micro server using that AMI. Once you make an AMI, shutdown the VPN server you created above and launch your AMI, I use this script. As you can see, I launch a t1.micro instance and am willing to pay no more than 0.02 (2 cents) per hour and I want this request to be persistent. It has worked well for me. 1. Some sites don’t work, others do. I used to have this problem and tracked it down to an issue with packet sizing. You should not have this problem if you correctly followed step 3 above. The two commands for iptables (the second in particular) was something I added to fix this problem. 2. Problems connecting from Ubuntu. 4. From time to time I am unable to access my VPN. The first thing to do is to make sure that you are able to ping your VPN server. If you configured your firewall the way I proposed above, you should be able to do this. Use the same name that you are providing to your VPN connection. If you are unable to ping the server, you know to start looking outside your VPN server, if you are able to ping your VPN server, attempt to SSH to it and make sure you are able to connect to it. This latter step is important because you want to make sure that you are in-fact pingingyour VPN server, not one that happens to be responding to the name you provided. If you are able to SSH to the VPN server but not connect to it using a VPN client, it is time to start looking at the log files from the VPN server (/var/log/syslog) and troubleshooting your configuration. I’ve generally found that if the initial AMI you setup works well, it is easiest to just restart the VPN server and go from there. great features that you will ever need in taking pictures. I almost dismissed this! I doubted that the extra iptables -I FORWARD on step 3 would fix my problem but glancing the common problem number 1 I decided to try it and it saved my life!!! Never would have figure it out on my on (I not a infrastructure guy)!